An “uncontested divorce” is a divorce without any issues to resolve. When a marriage relationship ends, and the parties can agree to satisfactory terms, the divorce is considered “uncontested.” This type of divorce can be processed in a relatively short amount of time (approximately 40 to 60 days). 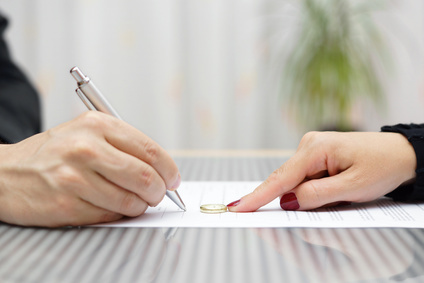 The costs are significantly reduced for obtaining the divorce IF it is truly uncontested. It is also necessary for both parties to know each other’s addresses and for both to be aware that the process is occurring. Uncontested divorce is not only an inexpensive alternative for low income households, it is a mature resolution when the parties are capable of fairness and considerate negotiation. A welcome change to the “War of the Roses” mentality of divorce, many couples can accept the “Cool Hand Luke” realization that they have a failure to communicate, and move forward with a new understanding. NASCAR driver Danica Patrick and her ex-husband Paul Hospenthal divorced in 2013. Their uncontested divorce decree refers to the parties as “…participating in a mediation process in order to arrive at a fair and equitable settlement.” While there are pre-requisites to a collaborative or mediated agreement, the end result is to enable the court process to proceed in a straightforward manner. Cost conscious divorcees-to-be often desire an uncontested divorce, without realizing that a pure uncontested divorce requires all issues to be resolved or non-existent. If there are any assets or property in dispute, the divorce must be considered “contested.” Some matters must be resolved prior to a divorce or the parties forever waive the ability to pursue certain claims. For example, in North Carolina, rights to Equitable Distribution (of the property and debts) and Alimony are waived if not addressed prior to the decree of divorce. Custody can be addressed at any time, but should be considered prior to the entry of divorce so that, when appropriate, the details of custody, visitation, and support can be included in the court order of divorce. Entering the custody, visitation, and support in the court order is different from entering into an agreement, which is governed by contract law. Custody issues may need the power of the court to keep the agreement enforced. Sometimes, the court’s power to enforce an order better serves the needs of both parties than its power to enforce a custody contract. A “pure” uncontested divorce meets what laypersons understand the definition to be. A scenario where there are no children, no assets and no debts—and wherein both parties have remained individually responsible for their own individual finances during the marriage, the “pure” or simple uncontested divorce enables such individuals to keep the cost of the divorce to a bare minimum. This relatively narrow subset of divorcees can benefit from lawyers advertising a low-cost uncontested divorce. When there is nothing to either litigate or mediate, divorce can be simply a matter of processing the divorce paperwork for approval by a Clerk of Court, resulting in a divorce decree. There is a perceived hook to low-cost uncontested divorce advertised by attorneys – rarely is everything “pure” or simple. Each particular couple’s circumstances have to be considered to determine that there are no issues to resolve. To be exact, each individual’s circumstances need to be considered. Uncontested divorce is more than being eligible for the low cost of processing an uncontested divorce as advertised; it is a culmination of the parties agreeing that all issues have been resolved prior to the filing for divorce. There is an additional cost to drafting separation agreements that address issues such as custody, division of assets and/or debts, support for a dependent spouse and other matters. The first step is for the individuals to be aware of what their individual options are; the second step is to determine how you want to handle the matters that need to be addressed and how you expect your soon-to-be-ex wants to handle the matters that need to be addressed. Many attorneys in family law and divorce practices offer low cost consultations so that you can receive expert advice when determining what route you will need to take.